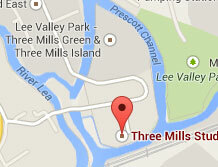 3 Mills Studios is owned by the London Legacy Development Corporation (LLDC) and managed by Knight Frank LLP on behalf of the LLDC. Your name, email address, job title and any other information you voluntarily provide to us via our online enquiry forms or emails sent to us. We use your data to provide any services you request from us and also pursue 3 Mills Studios’ legitimate interests in promoting our studio spaces, news and events. We keep details of contracted bookings for seven years for tax and accounting reasons. We will keep your contact details for three years after the date of your last enquiry in case you want to make a future booking. We will delete your email address from our e-newsletter mailing list as soon as possible after you unsubscribe from the mailing list. You can do this at any time using the unsubscribe link at the bottom of any e-newsletter we send you. Your data will be stored on secure servers at the 3 Mills Studios offices in London, and securely backed up on secure external servers in London. Some data (including, but not limited to, information relating to invoices issued and paid) will also be stored on Knight Frank’s secure servers in London. Other data (including, but not limited to, information relating to executed contracts) will also be kept at the LLDC offices in London and/or stored on the LLDC’s secure servers in London. We also use cloud based services to store and process data about clients. Some of these cloud providers store data in the United States. In these cases the providers are certified under the EU-US privacy shield framework (see https://www.privacyshield.gov/welcome). In addition to this our contracts with these providers include clauses which guarantee that they provide the same safeguards for the data and rights to our members as if the data were stored in the EU. More information about the security measures put in place by these providers is linked to below. What data: All data collected about enquiries and bookings at 3 Mills Studios is stored in 4S Systems’ Studio Bookings System. What data: Any contact details you provide us with and any other information you voluntarily provide to us via our online enquiry forms or emails sent to us. We will never share your personal information with a third party, unless required to do so by law or for the purposes of crime prevention or detection. We have appropriate technical and organisational measures in place to prevent the loss, misuse or alteration of your personal information. Any personal information you provide to us is stored securely on password and firewall protected servers. Any newsletter or marketing email which you receive from us will contain an unsubscribe option. If you want to bring in third party suppliers such as caterers we can, if you wish, make an introduction for you. If you have requested that we do this then we will pass your contact details on to suitable carefully selected partners. Please provide details in your email/letter of what actions you would like us to take. Depending on the nature of the request and whether or not your request comes from the email address we have on file for you, we may need to verify your identity so that we don’t give out information to the wrong person. In most cases it helps if you are able to provide a contact phone number so that we can validate your identify and discuss the request with you. If you are concerned about how we manage your data, or how we have handled a request to exercise your rights, then please get in touch with us to discuss it. To do this please send an email detailing your concerns to bookings@3mills.com. The information that these cookies provide will help us to improve our site by telling us which pages you find useful and which pages you do not.